Recently a cool app for visualizing your primary LinkedIn network has been the talk of Twitter. Mine looks like the ‘hand turkeys’ kids draw around Thanksgiving, what does it mean? I’m not sure how useful it is beyond a curiosity of how your network grows. You can click on users and see who they’re connected to and get a feeling for their expertise, but you likely already know this information. See my insights below the image. Related companies (the middle fingers) are grouped together because, well, they’re related, and there is cross talk between them as far as personnel. All of the work I do or did here represented here is directly related to my training as an X-ray crystallographer (in a galaxy far, far, away). I’ve worked in the more general field of life science, and these companies are represented by the thumb and pinkie. My job at LIFE was in informatics, which is more related to the ‘finger’ companies closest to it, and my job at EMD was in signal transduction, more related to the drug discovery services ‘fingers’ closest to it. I am surprised that the thumb and pinkie aren’t closer together, because both companies have major offices in the San Diego area, and I know many that have worked at both. Hard to say and likely not worth thinking about too much. The palm represents my current connections and business, and it shows I’ve been able to branch out well from the companies I’ve worked at or with. I was not able to find a ‘San Diego’ centric group, which bodes well for how we’re all connecting in this virtual life science economy. Interestingly, I’m able to see a great ‘life line’ in the palm of this diagram, indicating the long life of Comprendia ;). Will you get actionable information from your LinkedIn Map? I could imagine situations in which you will realize connections to leverage or see gaps in your network which you could remedy as well. Check it out and link to yours below if you’d like, we’ll see how many more networking turkeys there are! William Gunn has posted his, and I’m happy that he considers me as someone who has helped to build his network, and that’s what it’s all about! Thanks for pointing out this cool toy. 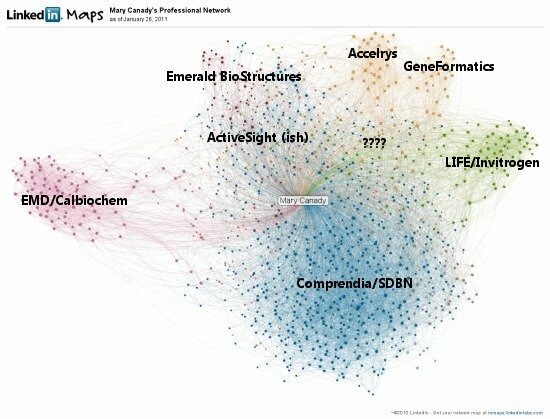 My InMap is a whirl ‘with life science players’ permeating the entire network: http://linkd.in/PNMap . Now what?